Marketing today means brands must stand for something– even if it means sacrificing a segment of their customers in order to be cool with the segment they are consciously targeting. Sadly, but predictably, the political polarization of the market by politicians and their followers is forcing companies to examine their values and take a visible stand. This past week has seen Nike step up and make what analysts are calling a “risky” values-based branding bet. As we mentioned earlier, stakeholders around the world, especially millennials, now expect businesses to engage in progressive brand activism. 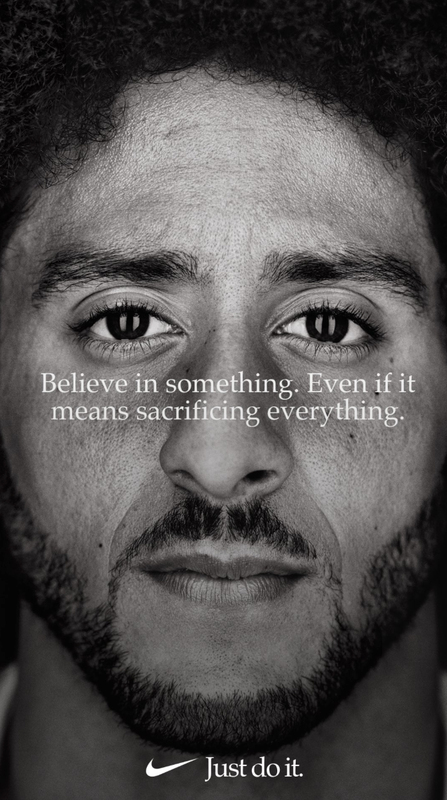 When Nike decided to make Colin Kaepernick the face of the 30th anniversary commemoration of their Just Do It campaign, they became a leader in brand activism overnight. 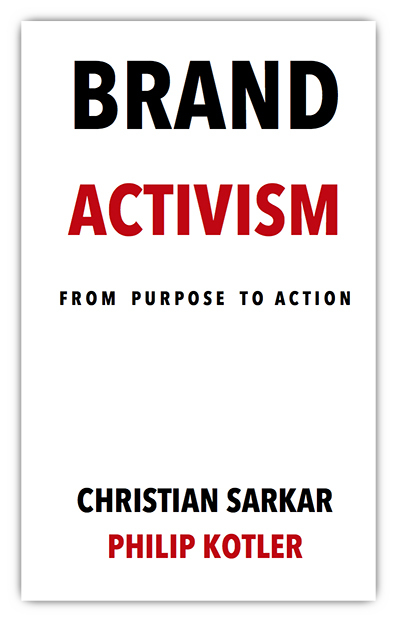 Is Brand Activism Good for Business? Within less than 24 hours since Kaepernick first revealed the spot on Twitter, Bloomberg reports that Nike received more than $43 million worth of media exposure. 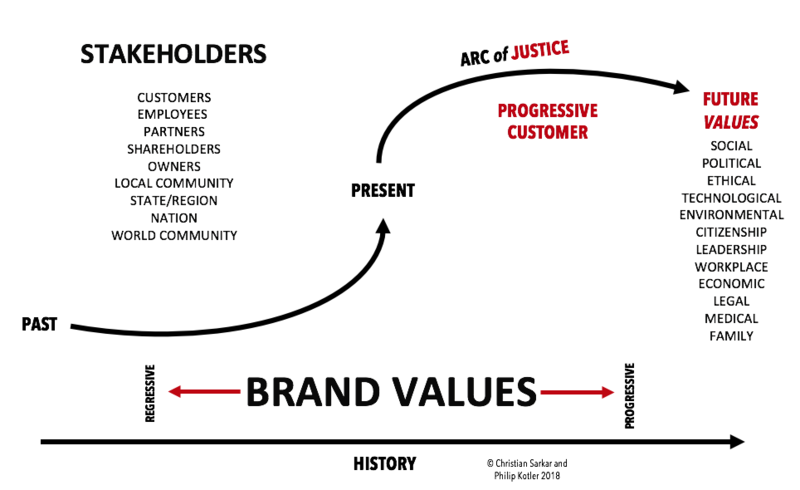 Why is brand activism the next logical step for purpose-driven or values-based companies? Because actions speak louder than words (or ads). Also, it can be profitable. In some cases, taking a stand is a strategic move that improves profits. 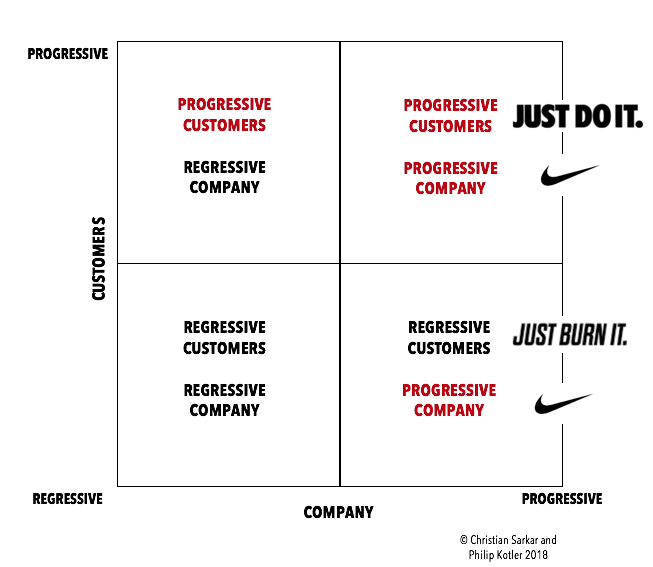 The first step is to examine where your brand-values place your company and your target customers on this chart: In Nike’s case, the chart would look something like this: The progressive customers (Generation Z and millennials) buy more Nike products (Just Do It), while regressive customers protest (Just Burn It). Nike registers $35B in revenues — $15B domestically and $20B abroad. Two-thirds of Nike consumers are under the age of 35. A younger consumer who can afford $150 Flyknit racers likely has substantial disposable income and lives in a city. The term for this cohort? Progressive. Of the $20B international customer base, how many believe the US is currently a “beacon on a hill” and is handling race issues well? I’ll speculate, none. Nike has risked $1-3B in business to strengthen their relationship with consumers who account for $32-34B of their franchise. The math? Nike just did it. 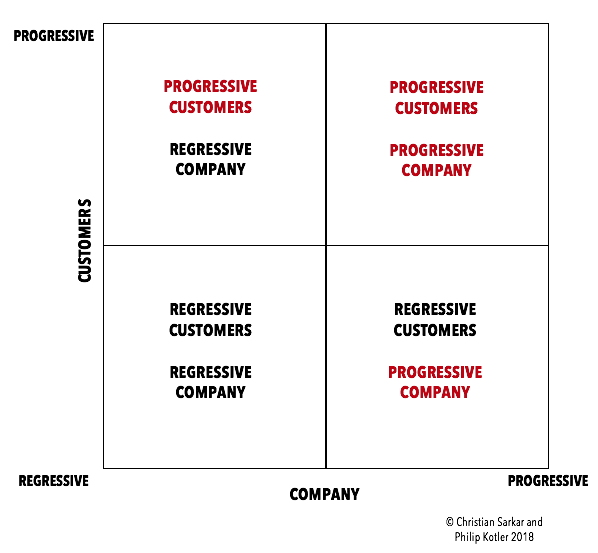 What this means is that companies must understand the trajectory of the customer’s social beliefs, and race to meet them. The leaders will, in all probability, profit over the laggards. People want brands to take stands on important issues, and social media is the place for it. 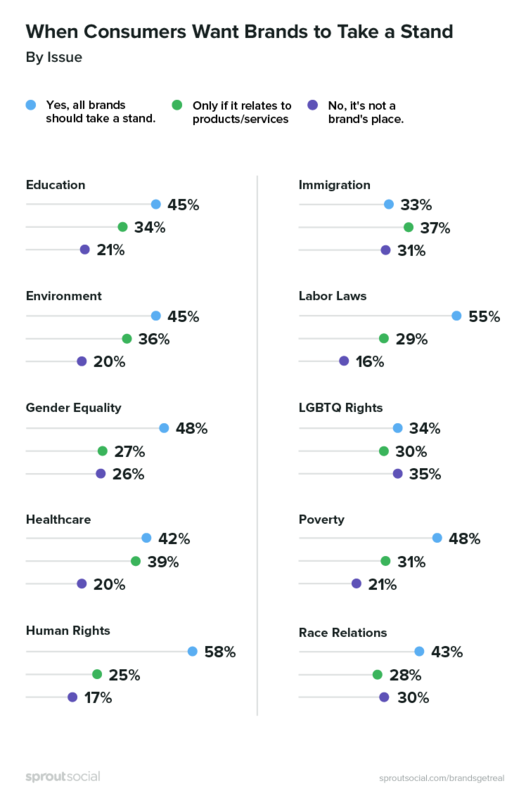 Two-thirds of consumers (66%) say it’s important for brands to take public stands on social and political issues, and more than half (58%) are open to this happening on social media – the top channel for consumer receptivity. Brands can’t change minds, but they can effect change. Sixty-six percent of respondents say posts from brands rarely or never influence their opinions on social issues. Rather, respondents believe brands are more effective on social media when they announce donations to specific causes (39%) and encourage followers to take specific steps to support causes (37%), such as participating in events or making their own donations. Liberals are galvanized by brands that take stands, while conservatives are indifferent. Seventy-eight percent of respondents who self-identify as liberal want brands to take a stand, while just about half (52%) of respondents who self-identify as conservative feel the same. Likewise, 82% of liberals feel brands are credible when taking stands, compared to just 46% of conservatives. Relevance is key to reception. Consumers say brands are most credible when an issue directly impacts their customers (47%), employees (40%) and business operations (31%). Brands face more reward than risk. Consumers’ most common emotional reactions to brands taking a stand on social were positive, with intrigued, impressed and engaged emerging as the top three consumer reactions. Likewise, when consumers’ personal beliefs align with what brands are saying, 28% will publicly praise a company. When individuals disagree with the brand’s stance, 20% will publicly criticize a company. What’s more the survey also discovers that respondents want brands to take stands depending on the issue: And, in terms of leadership, another survey by BRANDfog and McPherson Strategies tells us that 93% of respondents agree: “When CEOs issue statements about the key social issues of our time and I agree with the sentiment, I am more likely to make a purchase from that company.” 86% of people think that CEOs who publicly defend the rights of others on social media are seen as great leaders. So where does this leave Nike? As Nike starts down this road of brand activism, they are going to have to be more progressive in order to combat the image of exploitative sweatshop labor and gender inequality in the workplace. Nike’s progressive customers would not have it any other way.